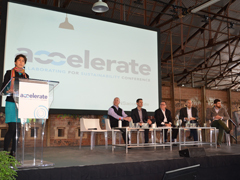 On June 5-6, 2014, The Natural Step Canada convened the second Accelerate: Collaborating for Sustainability Conference at the Evergreen Brick Works site in Toronto. The event was attended by over 160 distinguished delegates from a wide variety of professional backgrounds. With 37 impressive presenters and facilitators sharing their expertise and harvesting the vast experience in the audience, we designed the two days around the theme of collaboration and constructed an agenda that took participants through a variety of engagement formats. Accelerate included a series of fabulous keynote speeches, several panel discussions, skill-building workshops, open space sessions (where the delegates proposed and hosted the topics), and even a sustainability gap exercise that used LEGO to rapidly build prototyping models of our current state and a sustainable future for our energy sector. We heard stories of success. We heard stories of failure. Collectively, we strengthened our collaboration muscles and enhanced our networks—now hopefully stronger and better equipped to continue with our change efforts. 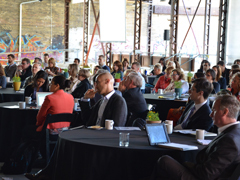 The Evergreen Brick Works was the perfect site to host this gathering. The food, the fresh air, and the demonstration of what sustainable re-design can look like nourished us, allowed us to deepen our practice, and helped to broaden our perspectives. Below, you’ll find some information about the conference, harvested from a variety of sources. We hope that you find it useful. 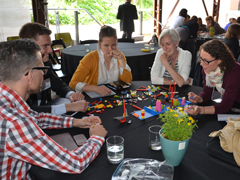 The Natural Step Canada convenes Accelerate because we—and the organizations we work with—realize that an organization can only go so far alone on their sustainability journey before they run up against barriers that require them to work with new partners. We hear the increasing calls for greater engagement and collaboration with diverse groups to solve the complex sustainability challenges of our time. 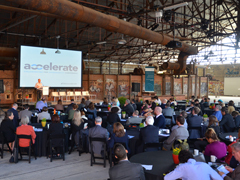 Accelerate offers a unique opportunity to deepen learning about collaboration from experts and practitioners, to experience collaboration by creating connections with other change agents, and to seed new collaborative initiatives. Using a mix of plenary, breakout, and group sessions, we showcase the expertise and real life experience of dozens of speakers from across all sectors and backgrounds. Accelerate includes keynote talks from world-renowned experts, sessions delivered by talented practitioners, and interactive workshops and dialogues. It’s all about sharing and learning together. It's a different kind of conference. Click here to visit our agenda page to view speaker slides used at the conference. Browse through the #TNSaccelerate Twitter feed or view in Excel. Thank you to all of the incredible Accelerate delegates who contributed to the discussions, asked thoughtful questions, shared their passions, and made Accelerate come to life. Of course, Accelerate would not have been possible without the generous support of our sponsors and endorsing partners. We extend a heartfelt thank you to each of them. Please contact us at info(at)naturalstep.ca or call 613.748.3001.